We’ve been eyeing this impressive treelet since 2010. Just unfortunate that the nursery in our neighbourhood didn’t have young plants for sale then. The matured ones with several heads would have dug a big hole in our pocket as the prices were between RM200-250, way beyond our budget. 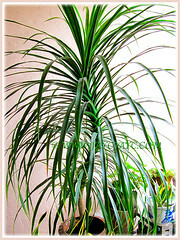 Our patience paid well and in late November 2011,we were able to purchase our dream and long awaited Dracaena marginata for RM28, apretty good deal for a healthy young plant. 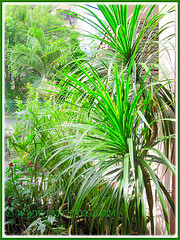 Initially, the Dracaena marginata was located at the porch, just outside the sliding glass doors and it flourished luxuriantly. Truly a gardener’s delight! Though a slow-growing plant, we were greeted by a small plantlet that sprouted at the side of the main stem, slightly more than a year later. What a wonderful surprise! Thus, to do it justice, we decided to relocate this robust beauty to a conducive and favourable site where it can stand majestically and be admired by one and all. 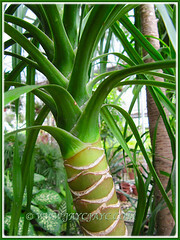 Common Name: Madagascar Dragon Tree, Red-edged Dracaena. Etymology: The genus, Dracaena is from the Ancient Greek word, drakaina, meaning female dragon, referring to the resinous red gum that exudes from cut stems, when thickened, is supposed to resemble dragon’s blood in European legends. Plant type: A tropical ornamental shrub or small tree. 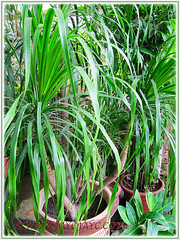 Features: Dracaena marginata is a species in the genus Dracaena that comprises of about 110 species of plants. In its native habitat, it can tower within 4.6-6.1 meter, but generally grows to 1.8-2.4 m tall as a houseplant or outdoor in the garden. It is slow-growing, especially if grown indoors. An evergreen shrub or small tree that produces upright and slightly curved greyish stems that are crowned with tufts of slender, arching, glossy and leathery leaves. 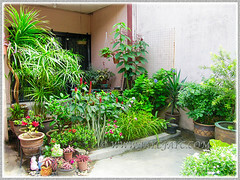 The dark green coloured leaves are simple, narrow and sword-shaped, measuring about 60.96 cm long and 1.5-2 cm wide. Occasionally, it sends out plantlets at the nodes where the leaves are shed. The leaves are arranged in an ascending spiral around the stems. As it matures gracefully, the lower leaves withers and are removed, leaving a lovely distinctive diamond-shaped leaf scars on the stems. It is known to produce fragrant tiny white flowers that are followed by spherical yellow-orange berries, but we haven’t seen any so far. 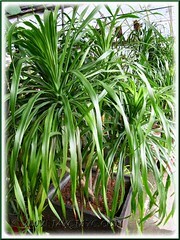 Culture (Care): Dracaena marginata grows easily with the least care. Great for beginners. Light: Bright light if grown indoors or filtered sunlight to light shade outdoors. However, it grows best in morning sun and afternoon shade. It loves warm and humid conditions. Moisture: Average water needs. Do not overwater. Allow the surface soil to dry out between waterings, especially if plant is potted. Tolerate some neglect and drought. Soil: Any loamy, peaty and well-draining potting soil will do. Others: Do not use water with high levels of fluoride that can damage the plant. Allow tap water to sit overnight before use or use rain water. 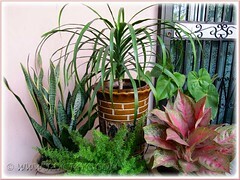 If grown indoor as a potted plant, shower it occasionally to remove accumulated dust. Browning of leaf tips may be due to soils being too wet or too dry. Even dry air or cold drafts can cause the leaf tips to brown and margins to turn yellow. However, yellowing of lower leaves occur naturally and are eventually shed. Feed it with a balanced houseplant fertiliser once monthly. Cut back your plant when it becomes leggy or too tall to within about 30 cm from base and use the tip and stem cuttings to propagate new plants. Do not worry about pruning as more new shoots will emerge from the nodes of the parent plant, resulting into an elegant display with several heads eventually. Generally free from serious pests and diseases but do watch out for spider mites and scale. For subtropical and temperate regions: Hardiness: USDA Zone 10a – 11.For non-hardy regions, best to grow indoors as a houseplant or outdoors in a pot that can be brought indoors during winter. Soil to be kept uniformly moist during the growing season but water much less from autumn to late winter as overwatering may cause brown tips on leaves or root rot. It’s drought tolerant and can survive a chill if soil is kept only slightly moist. It can tolerate low temperatures over a short period, but best to keep it warm and draft-free. Propagation: By tip or stem cuttings. 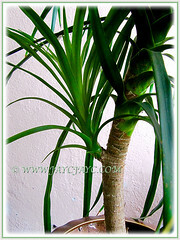 Check out this youtube video on propagating Dracaena marginata by jkontrad. 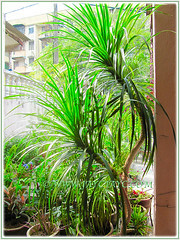 Usage: Dracaena marginata, the green variety will make an impressive and bold foliage plant whether indoors or outdoors. Perfect to be grown indoors as a houseplant to silhouette against a wall or dominate a corner of any room. 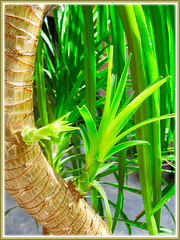 Ideal plant to be grown outdoors as an eye-catching focal point in any garden for that tropical and exotic look. Also suitable to landscape several plants together to form hedges or fence for some privacy. Complement by encircling it with a crowd of colourful and low-growing variegated foliage or flowering plants for dramatic combinations. 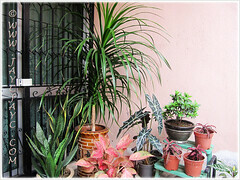 Excellent for container planting and located at patio, porch and courtyard as specimen plants. Suitable as backdrop small tree in garden borders or beds. A durable plant that is popularly used indoors in office buildings, hotels and malls. D. marginata ‘Tricolor’ with dark red margins, green and ivory stripes down the leaf centre. D. marginata ‘Bicolor’ with red and green stripes. D. marginata ‘Colorama’ with green and yellow stripes and bold red stripes on leaf margins.